Located in the Gard department about 20 minutes from Chateauneuf du Pape, Tavel is the only appellation in France devoted solely to rosé wine. The appellation was one of the first in France, created in 1936. 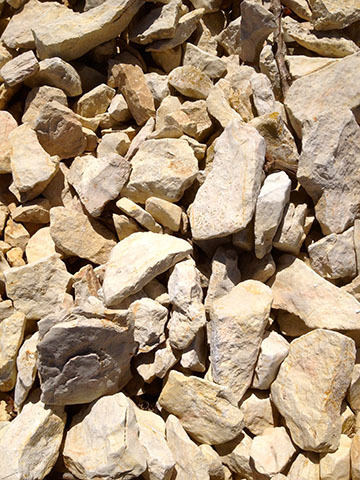 Its 933 hectares lie solely in the commune of Tavel and grapes are grown on three different soil types: (1) Flat white stones that look like pieces of slate and made of lauze. (2) Galets roulets, the large, round stones also found in Lirac and Chateaneuf du Pape. (3) Sandy soils with some small rocks mixed in. Tavel is one of the most full-bodied roses of France, partially due to its terroir and climate but also due to its grapes. While 9 varieties are permitted, the chief grapes are Grenache, Cinsault, Syrah, Mourvedre and Clairete (a white grape). However, Picpoul, Carignan and Bourboulenc are sometimes employed. Tavel is surrounded by inhospitable garrigue, the odd scrub pine grove and the constant cadence of cicadas. It’s not the type of place you’d want to be lost in without liquids. It is dry and sweltering in the mid-summer. In can be very oppressive. Yet from this austere environment comes one of the most distinctive roses available: The fermentation of the grapes generally combines bleeding and direct pressing. Both red and white grapes go into the same tanks where they are cooled and undergo a cold maceration for about 36 hours. The juice that runs off is a saignée of the juice. What remains in the tanks is then pressed lightly, giving juice with a bit more color and structure. As Tavel does not make red wine, the point of their saignée is not to gain concentration for another wine but to obtain a must with intense fruit flavors. The grapes then undergo a full fermentation that lasts about two weeks. The wines are racked and raised over the course of four to six months before being blended and bottled. Tavel always has a deep hue, almost like a light red wine. Because a paler, Provencal color is certainly in vogue among wine consumers, Tavel has lost some fans over the recent years. But it is important to remember that Tavel is coming from similar terroir to the most of the Southern Rhone’s biggest wines, and made with similar grapes. People in this area don’t drink much white wine (there isn’t much made) and during the hot summer months, especially when locals frequently grill and eat outside at night, Tavel is the perfect accompaniment. After all, local reds would be too heavy and alcoholic, and pale colored roses when presented with flavorful foods off the barbecue would hide under a rock and cry out for mommy! ​Lirac is located about 15 kilometers from Avignon and 15 kilometers from Chateauneuf du Pape on the right bank for the Rhone River. It is separated from Tavel by a small road that runs between the vineyards. There are 715 hectares under vine and about 2,500,000 bottles are produced a year. Obtaining its AOC in 1947, about 85% of the wine is red, although white and rose wines are also made. Three types of soil cover Lirac: Limestone scree lie along the appellation’s outer edge. These soils tend to give freshness and minerality to the wines. The main soil in is found on the slightly higher vineyards, where large rocks lie atop red clay. These soils, very similar to Chateauneuf du Pape, guard heat and help produce wines that are powerful, structured and with excellent aging potential. A third soil, consisting of sandy terraces embedded with pebbles and gravel, aid in creating fine wines with an elegant tannic structure.